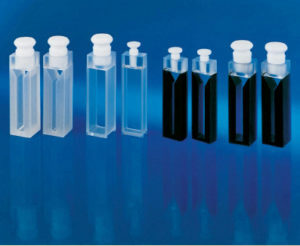 We supply many types of UV­VIS-NIR spectrophotometer cells including micro-cells. Samples to be measured for absorbance or transmission are held in cells for all common spectrophotometers. Our cells comply with international standards and are compatible with many brands of spectrophotometers. Now it has formed 16 series and 500 different kinds of cells. Our cells are 100% handcrafted and 100% individually inspected. All quartz cells are fused and ready for ultra­sonic cleaning plus heavy solvent use. We developed the melting cementation technology of integrated forming and achieved the international advanced level. We overcame the limitation of low technology content: degumming, leakage, low light measuring precision and etc. For all Type 1 cells with a 10mm path length, we offer sets with 2 or 4 cells matched for transmittance < 3%. This offer includes all glass types G, Q and I.